Last year, the Clayton Christensen, one of the world’s top management thinkers, suggested that, despite being awash in cash, corporations are “failing to invest in innovations that might foster growth.” He considers this trend so insidious and pervasive that he called it the capitalist’s dilemma in Harvard Business Review. Others have seized on the current boom in stock buybacks as evidence that supports Christensen’s narrative—intense pressure from activist investors is creating an environment in which short-term profits trump long-term prosperity. If true, it’s a terrible indictment of our economic system. Yet buybacks do not necessarily indicate a lack of investment (especially when capital is, as Christensen points out, superabundant). Only a lack of investment indicates a lack of investment. When I looked into it, I found that the issue does not lie in the private sector, but the public one. In effect, it’s not corporations that are the real problem, but the rest of us. To illustrate the disconnect, the case of Apple is an instructive, if extreme, example. Last year, the company spent $56 billion on share repurchases. That exceeds its operating income of $52.5 billion by more than 7%. Surely, it seems that Apple is rewarding investors at the expense of its future. But not so fast. A closer look reveals that Apple has been expanding investment on R&D at a compound rate of 28%, while also increasing its ratio of R&D to sales. What’s more, the company still holds more than $170 billion in cash that it has very little idea what to do with. Of course, Apple is an unusual company and not necessarily indicative of larger trends, but in this case, aggregate data looks similar. Thomson Reuters reports that companies around the world are sitting on $7 trillion in cash. 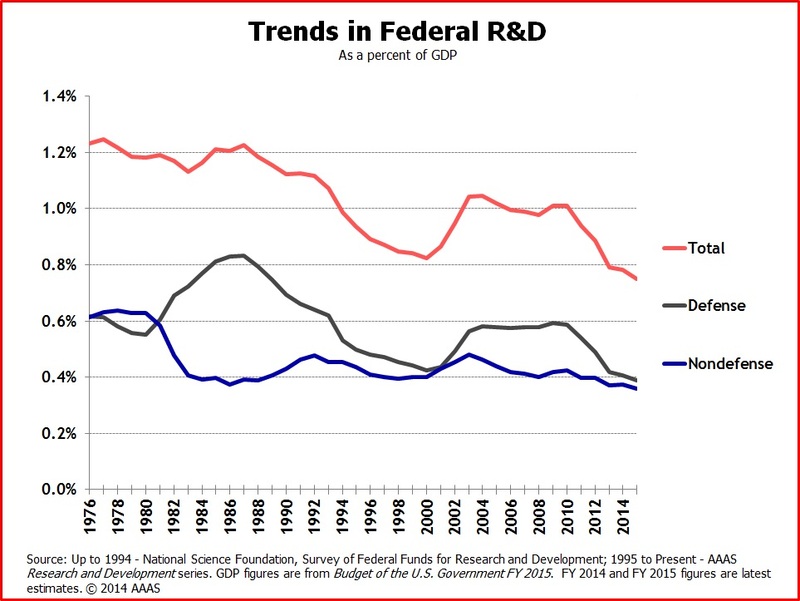 Further, data from National Science Foundation (NSF) shows an uptick in US business investment in R&D. As you can see from the chart above, business investment in R&D has not only been outpacing economic growth in recent years (2012 is the most recent year available), but is also outpacing historical trends. It’s hard to see how any objective reading of the data would indicate a crisis of business investment in innovation. Christensen and others also point to the weak economic growth in developed countries since the financial crisis as evidence that firms aren’t innovating. If corporations are engines of growth, so the thinking goes, then they must also be the source of stagnation. Yet Albert Wegner of Union Square Ventures explains why that’s not necessarily the case. There are many innovations that diminish economic growth. For example, in Peter Diamandis’s new book, Bold , he estimates that a smartphone today replaces applications that were worth $900,000 when they were first introduced. Look further and you’ll find similar trends throughout the economy. The shift from installed applications to cloud-based software is saving corporations billions, while improving performance. Advancements in solar, wind and shale technology are slashing energy costs. These innovations lower GDP, but make us better off nonetheless. Short Term Thinking Or Improving Capital Allocation? We should also question Christensen’s point that investor preference for quick returns limits managers’ ability to invest in the future. Here again, the evidence belies his point. In fact, data from the Federal Reserve Bank shows that private capital investment, an even larger ticket item than R&D, has also been increasing and is at historically high levels of GDP. That’s a crucial point. Money returned to investors, through buybacks or dividends, doesn’t simply disappear, it gets deployed elsewhere. So where does it go? Not to personal consumption, which remains sluggish, but to other kinds of investment. Weak housing data suggests that the money isn’t being frolicked away on McMansions either. In fact, it appears that a large chunk of the money corporations return to investors through buybacks is actually going to fund innovative new companies. The venture capital market has reached levels not seen since the dot com era and has produced an unprecedented number of billion dollar startups. So it appears that the current surge in share buybacks may be less short-term thinking and more an intelligent allocation of resources. Faced with a superabundance of capital, firms are both increasing investments and returning the excess to shareholders so that it can be invested elsewhere. Christensen is right about one thing. We do have a crisis, just not the one he thinks we have. The issue, in fact, lies not with corporations, but in the public sector. Unlike the private sector, public investment in infrastructure and science is massively underfunded. So the real problem isn’t that corporations are unwilling to think long term, but the rest of us. It’s easy to point our fingers at overpaid executives and greedy investors for short term thinking, but when it comes to our collective future, we are failing to live up to our basic responsibilities. The American Society of Civil Engineers gives US infrastructure a grade of D+ and we hardly take notice. A bill for an infrastructure bank, written in 2007, languishes in Congress due to lack of political support. Senators gain cheap political points by attacking the NSF and we cheer them on. We make drastic cuts to funding for an Ebola vaccine and then panic when there’s an outbreak. That’s the real capitalist’s dilemma. It’s much easier to demand lower taxes than to fix our crumbling roads, bridges and airports. It feels good to laugh at egghead scientists and their goofy research, but much harder to understand the significance of their work. I shudder to think of what political hay today’s leaders would make of Einstein’s notion of the relativity of time and space. The truth is that we can only win the future if we invest in it. It is, in fact, America’s postwar commitment to infrastructure and science that we have to thank for our current prosperity. So if we really care about innovation, we not only need to be forward looking in our private decisions, but our public ones as well. The problem is that corporations do not invest in startups and emerging companies, where the amounts are small as little as 250K to 5-10 millions. Some years ago, I was speaking with a development executive who told me their company could have bought a breakout company two years earlier for $5 million dollars, but instead they bought it now two years later for $50 million. They had so much cash they didn’t want to waste time on such a small investment.